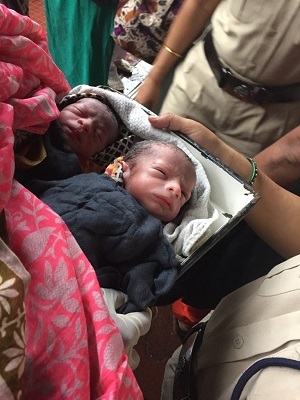 A 30-years-old woman delivered healthy twins aboard the Mumbai-Vishakhapatnam Express on Sunday. The incident took place as the train arrived at the platform number four, Kalyan station at 7.52 a.m. The woman, Salma Tabassum Shaikh, resident of Narayan Nagar, near Gausiya Masjid, Ghatkopar was travelling with her family. She suddenly went into labour pain. After receiving the information on duty police sub inspector Nitin Gaur, lady staff of RPF head Constables Neelam Gupta and Surekha Kadam attended the train coach No- E. Co. 14703. A short while later, Salma delivered the twins safely amidst cheers and claps by the passengers, railway and police staffers. She blessed with twins i.e. a baby girl and a baby boy. After the successful delivery, the woman deboarded the train and was taken in to the corporation run Rukminibai Hospital, Kalyan West. The condition of both the mother and her twins were fine. The train was halted at Kalyan for half an hour.